I decided to switch from clothes to housewares for this week, because even in my small apartment, I'm always looking for new little ways to add a bit of flare. I definitely need some plant stands and I think a gold watercan would be the perfect 'accessory' to my houseplants. Whoa, H&M does it again - the flowering can is the prettiest one I've ever seen! I go through phases with housewares. Sometimes I go months without even thinking about them, and then for a few months I'm obsessed with every print and decorative pillow I can find. 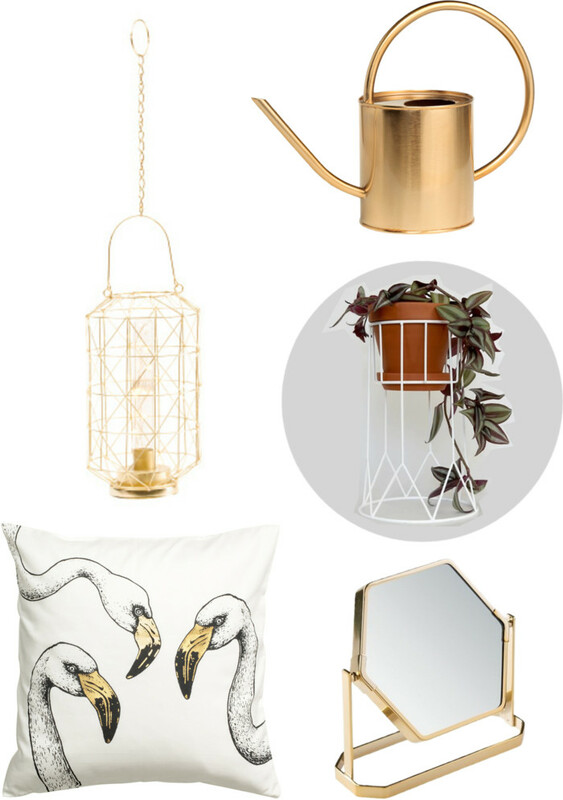 Either way, I do love touches of gold at home, and though I don't have any plants, I'm sure I could find a use for that gold watering can! H&M seriously has some killer home goods- and the price is nice, too! The watering can is fun! Reminds me a little of the ones we saw in Terrain, so cute! The watering can is so cute but if you have a small place its just better to water your plants with a glass of water ! You can use that space for something else, like that beautiful plant.. which BTW I have ! That hanging pendent is so cool. I love the warm gold hue! Happy Friday! These are such chic home pieces & you can't go wrong at these price points! Love the hanging light and the mirror! For some reason, I can't keep plants alive, but that watering can is so pretty! I love all of the gold pieces! Would love these for my place too! I never would have guessed that watering can was from H&M? It is too cute, as it the Nate Berkus mirror! That watering can is so adorable! Love it in gold! Great pack! I love the items! H&M has the best pillows! I always stock up on them every season! SO pretty! I love that light! I love that watering can. So chic.